aint this the truth? life wouldn't nearly be as fun or exciting without any of these. it's the simple things that are the best if you ask me. summer wouldn't be the same without late night swims. 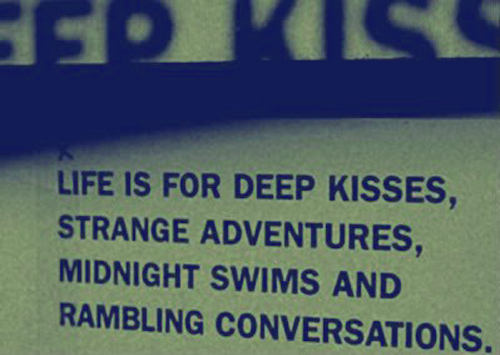 life would lack passion if it weren't for those deep kisses, we would be nowhere if we didn't go on adventures, & we wouldn't be as close with the ones we love if it weren't for ramblings. a perfect friend is someone i can ramble on with & not worry whether i'm boring them or not. i'm ready for to set out on a great adventure.